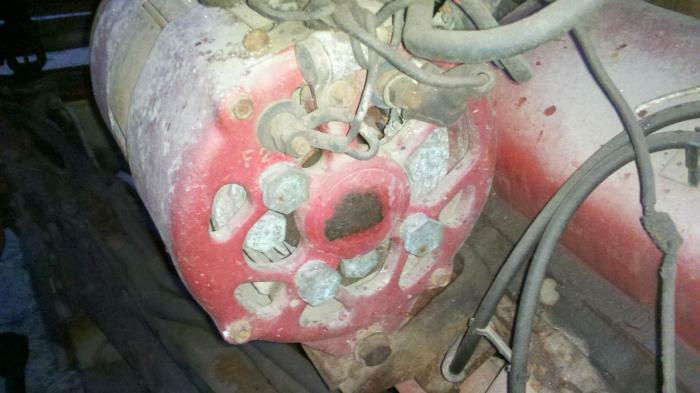 I need some help hooking the output wires on a 40-DN 130amp fire truck alternator. 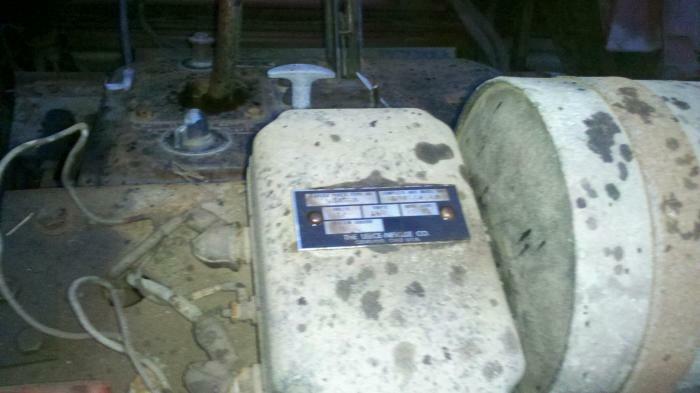 The truck originally had 2 batteries and a switch in the cab to choose which one to use and 2 start switches. Problem is that the batteries are gone and I have 3 post and 3 wires(4 gauge?) running no where. I'm guessing 1 ground and 2 12 volt? So anybody know whats what? Also I'm hoping to hook both 12 volts to the same battery (don't need 24 volts anywhere on the truck) so I get 130amps to one battery instead of 2. Anybody see any problems? Any ideas? Wiring diagrams? Thanks for looking. I don't know if this document has the info but it might help. Thanks that helps a little. My Google searches came up with similar material but I did actually see the 40DN listed there. It showed a side picture and said it was Discontinued and to replace with a 22SI. Really don't want to do that yet if i can just plug it in and have it work. But thanks. Figured I'd post some more Pictures. I know it was installed from the factory. 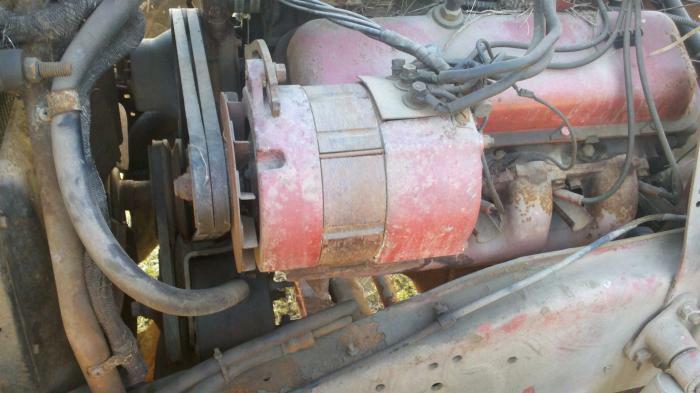 The GMC build sheet shows a Delco 130amp Generator (I think its really an Alternator, but maybe in 72 most people still called them a Generator). Seems somebody unpluged the little GM regulator and installed the leece-neville units. But I assume everything would work as soon as I hook up the out put wires. These are what are currently hooked up. 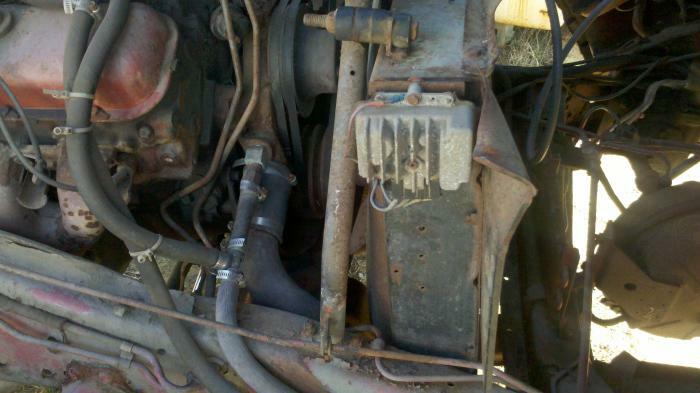 But as I said I just need to know what the 3 posts on top of the alternator ouput to. Wolf----Firetrucks all seemed to have a screwed up wiring concept that carried over from the gas engine days . They had a duplicate set of batteries on 12 Volts hooked through a Cole Hersey master disconnect switch . They referred tothem as the "A" set and "B" set and supposedly switched one way or the other for odd and even days . Perhaps some times it became useful if the charging system failed and battery depleted to the point of shutdown ,they could switchto the other set of batteries and at least get back to the firehouse without a tow . I have some old Delco bibles that go back to that era and maybe beyond . I'll look tomorrow to see if I can help . The three taps on the top of the alternator are A/C taps, they output three phase current. The are sometimes connected to transformers to output a different voltage (in three pase A/C) and other time are connected to another set of "remote mount" diodes to lessen the load and therefore the heat biuldup on the internal diodes. This is often done when continuious D/C loads exceed 30% of the alternators rated current output. I suspect the latter on a firetuck install, as the DC loads can be quite high. Diodes esp in that era, were the weak point in alternators (still are to some point), so an effort was made to lessen the load on individual diodes. I don't have a diagram on the 40DN with me (or may be at all) but it looks like the connections on the back are F1 and F2 which would be the field. You can use any regulator (even an old generator regulator) with this kind of set-up. Regulators either "switch" the postive feed to the field or the ground tothe field (so called "A" or "B" circuit regulators) and that alternator can be set up for either. 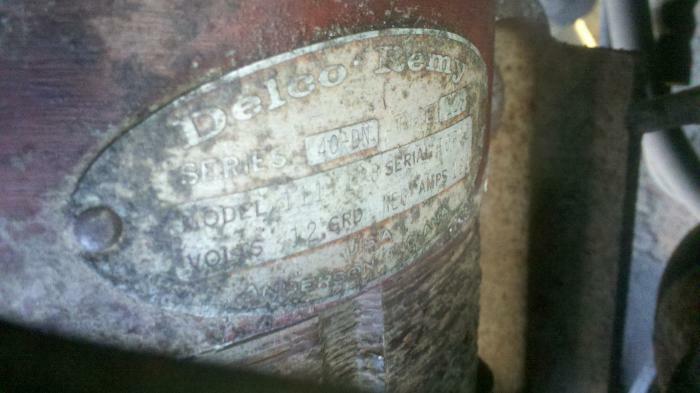 Oh, and Delco has always called their "alternators' generators. AS the term alternator means it makes AC current while Generator makes DC current. To Delco's way of thinking, the unit outputs DC and therefore is a Generator. The Correct term would be " Rectifed output Alternator" which no one uses. The AC output on a fire truck was usually for 110-120 volts AC. The 12 volt stud (BAT) is internally rectified and regulated externally and is ready to go the batteries. See attached. This regulator looks like a Delco 30 RD series. Tony, Any idea what they would use three phase a/c for? I can't imagine what the use would be with the Hz varying with engine speed and so little current avaiable if hooked to only one of the phases. I suppose if you rectified to DC at 120 volt or so you could power a small "univerasl" type motor, but still the most you could expect is 10 amps or so. You can still buy remote mount rectifers. Transpo makes a unit they claim can deliver 225 amps continuous, if you have a big enough alternator. Geoff, your right about the frequency and current. I assume they would rectify it and then regulate the voltage with an inverter. I was only quoting what the Delco book said. Wolf I'm just curious what the three phase AC is used for here. Can you post a close-up of this tag? The orange or red can next to it may not be a reg, it might be a field relay. That alterrnator can be wired to be controlled by just about any reg. I too would be intrested in what the tag on the box says. I'll get some pictures this afternoon. Found the battery post on it today. It was to far on the inside for me to see. I'd imagine the 115 volt side was used for tungsten or mercury flood lights. I don't think the spot lights or head lights are all that bright. A 115volt AC light shouldn't care about the frequency when it was running at pumping speed. But the bed and pumps are gone so I don't know. I was going to use the battery switch as a master switch but it seems the system is split in half so I either have to connect both relays to the battery or move both sets of wires to the same relay. Judgeing from the tag on the box, it is another rectifier. That way they could charge both batterys, but keep them seperate, if the DC load exceeded the output from the altenator, and the ran one battery low, they could switch to the other. The telling spec's on the box is 12 volt 160 amps, or may be it says 130 amps. So it is not a step-up transformer. The problem with stepping up an automotive alternators, is they are three-phase, and to load them with any kind of load, you must load all three phases, and that often means rectifieing to DC so all three phases carry the load. Not much use for 115 v DC. 115 volt is AC those leads currently go no where. 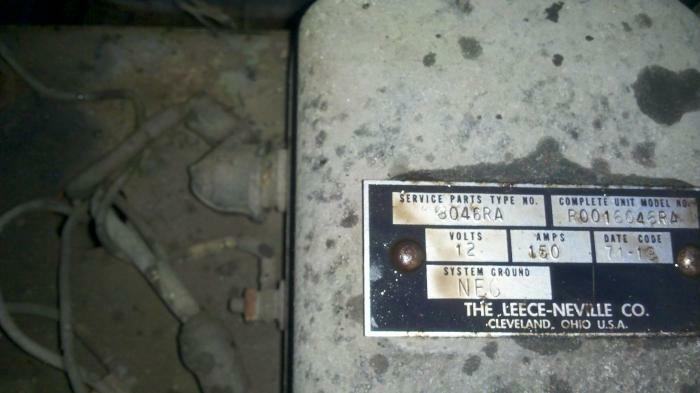 That black leece Neville unit says 12v dc 150 amp. I figured it was the regulator. Not sure now. The leads are marked G- (ground, though I'm not sure it goes to ground), IGN (switched, from the red box) and Bat+ (haven't traced yet. But i'd guess battery or maybe alternator output). My main goal was to find out what to do with those 115volt leads. They will be removed till I find a use for them. I've got some Mechanical work to do before I get to any real wiring. The AC taps are NOT 115 volt, more like 15V. You need a step up transformer to get higher voltage. you pic's don't show where the wires from the ac taps go. I was assumeing it went to the L/N box but it is not clear. 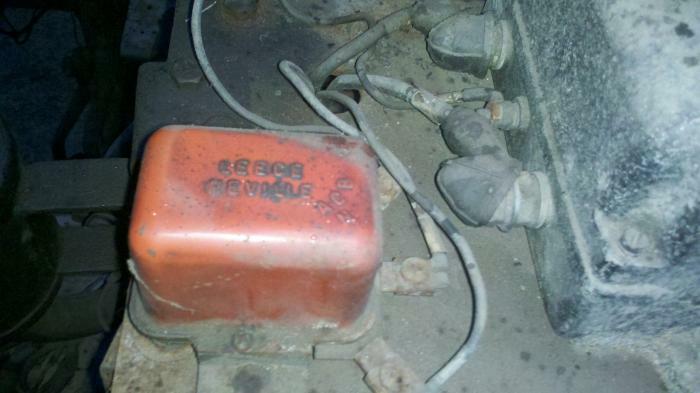 Unless you have transformers somewhere there is no high voltage on the truck. I think it is far more likely that is another set of diodes to give two seperate DC outputs from the alternator.